Feel confident, comfortable, and environmentally friendly when you use these reusable menstrual pads from Heart Felt! These bamboo menstrual pads include a charcoal layer, so they're super-absorbent, and a waterproof cover to prevent leaks and spills. Soft fleece makes them comfortable against the skin, while the easy-snap wings keep the pads in place. 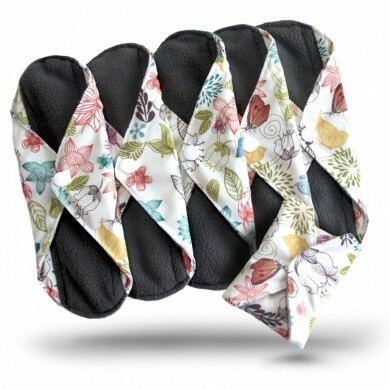 Easy to clean and with an attractive print, these reusable pads will also save you money -- up to hundreds of dollars over the lifetime of the cloth pad. These pads are a standard 8.5" long; for overnight or for girls and women with a heavier flow, you can get a 3-pack of 12" long extra-large pads here.